The thick blanket of smoke that’s fallen over the part of Wyoming where I’m currently vacationing has diminished the attractiveness of outdoor activity, and that in turn led me to do what I usually do on Saturday afternoons and Sunday mornings — listen to recent offerings of music from the darkest realms. Strong winds seem to be creating some clearing in the noxious fog from burning forests, so I probably won’t be writing a second part for this column, though I have more than enough new songs and full releases to justify it. I’ll have to content myself with the following five selections. 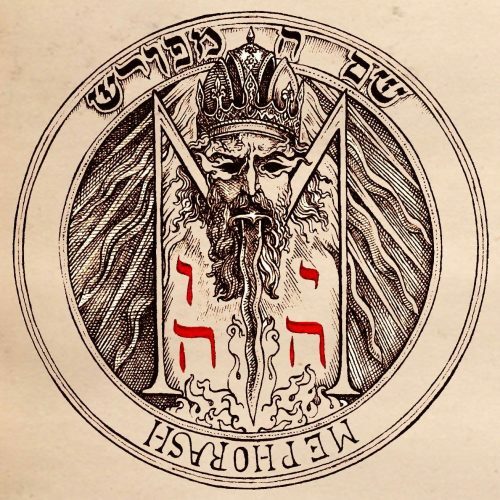 Last week brought us the second single from the fourth album, Shem Ha Mephorash, by the Swedish band Mephorash. The first single, “777: Third Woe“, was released way back in November of 2017, and it prompted me to marvel at its pitch-black devotion — music that was reverential, grandiose, and fearsome in its conjuring of majestic and sinister power (and also quite memorable). The new single, “King of Kings, Lord of Lords“, is again presented through a video made by Carl Eek Torgersen and features some of the beautiful artwork created for the record by Jose Gabriel Alegría Sabogal. A mood of reverence and foreboding emerges from the song’s introductory section, in which choral vocals sound like fallen angels rising above a building storm. Exotic, occult melodies also rise up, above ritualistic drum rhythms, creating an air of mystery and menace, with livid vocals and an eruption of blasting percussion deepening the feeling of menace. When the drums disappear, the music becomes shimmering and hypnotic, and then the intensity and power build again, surging toward a crescendo that’s both magisterial and terrifying, followed by the resurrection of those exotic melodic currents and the descent of the sound into bleakness and gloom — and one final, sweepingly grand, expression of fiery devotion and praise to the Lord of Lords. Shem Ha Mephorash will be released by Shadow Records, Helter Skelter Productions, and Blood Harvest later this year (the precise release date hasn’t yet been identified). For more info about the album and the philosophical concepts behind it, check out our extensive interview of the band from last May. The lyrics to this new song are included in the notes accompanying the video at YouTube. In 2015 we published multiple posts about the second album of a Slovenian band named Dalkhu, including one in which our then-contributor KevinP named it one of the five best albums released in August of that year. 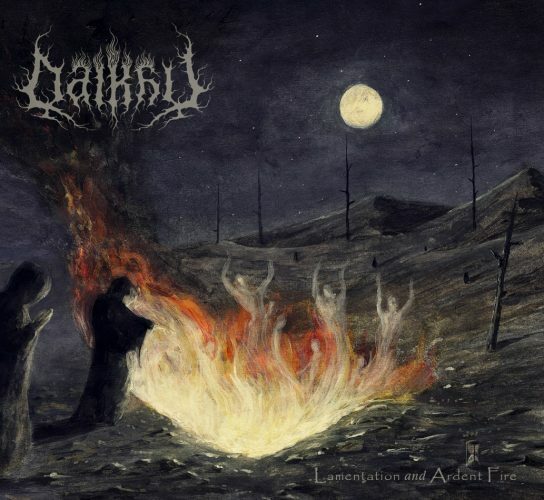 Descend…Into Nothingness really was strikingly impressive, and so it was welcome news that Dalkhu will be releasing a third album on September 17th via Godz ov War Productions. The name of the new one is Lamentation and Ardent Fire, and it includes the performance of a new vocalist, Lucerus (from the excellent black metal band Cvinger), in addition to founder J.G. (guitars, bass) and original drummer Kalki, who rejoined the band after an absence when the second album was recorded. I haven’t yet had time to listen to the entire album, but the new single released from the record through a lyric video is a vivid reminder of how good Dalkhu are. “The Dead Sleep With Their Eyes Open” conjoins riffs that are both slithering and serpentine, boiling and berserk, propelled by razor-sharp, neck-cracking drumwork and injected with an additional measure of zealotry by the ferocity of the vocal attack. But the vocals change in a way that gives the music a dimension of solemn beauty and soaring fervency, while the layered guitars and the heavy pulse of the bass drive the song’s mysterious and magnetic riffs and leads ever deeper into the mind. The song becomes mesmerizing — and then crashingly intense. Dalkhu’s last album featured cover art by Paolo Girardi, and that’s what first drew me to it. The artwork for this new record is no less eye-catching, and this time the painting was created by Misanthropic-Art. It seems like it was only a week ago when I was writing about this French band — because it was only a week ago. 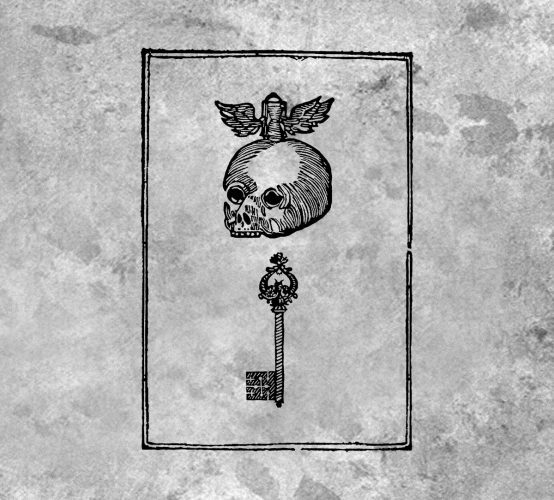 The occasion then was a pair of songs by Dysylumn and Malepeste from their forthcoming split, Ce qui fut, ce qui est, ce qui sera (“what once was, what it is, what it will be”), set for release on October 15th by Goathorned Productions. 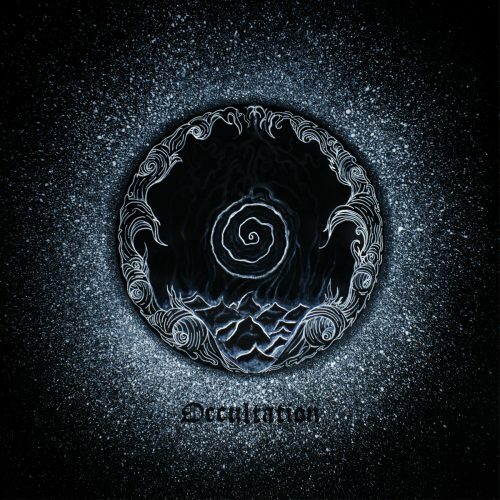 The occasion today is a pair of Dysylumn songs from their second album, Occultation, which will be released by Egregor Records on September 15th. These two multi-textured and tremendously immersive songs braid together vibrant, craggy bass lines, dynamic drumwork, horrific roaring and wailing vocals, and shimmering, cascading melodies that give the music an unearthly, mystical quality. Both tracks pull the listener into indigo-dark, eerie dimensions, where the music beguiles the mind, powerfully moves the head, and also creates moods of melancholy, fear, and glory. Just based on these two tracks, Occultation is an apt name for the album. Dysylumn prove themselves masters at creating music that’s both hallucinatory and yet primally powerful in its rhythmic drives. I decided to insert this next song as a change of pace and mood. “No Room For Hope” is a thoroughly electrifying gallop, combining jolting rhythms, immediately infectious riffs, glorious soloing, soaring and moody melodies, and a cavalcade of wild, changing vocals that add to the song’s tremendously exhilarating impact. It has the power of a warlike charge, and it’s also capable of making you feel as if you’ve left the earth, bound for clouds backlit by a blinding sun. 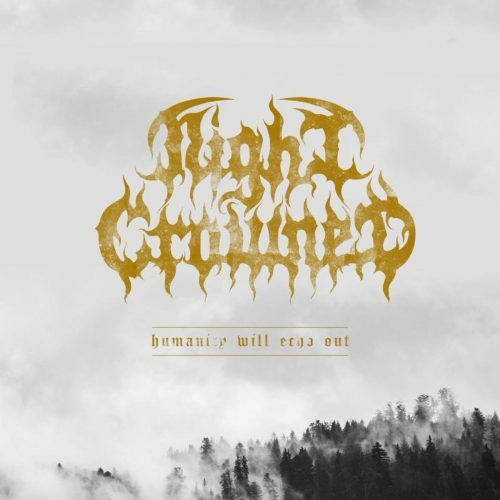 The track comes from Humanity Will Echo Out, the debut EP by a Swedish formation whose veteran line-up includes current and former members of such highly regarded bands as The Crown, Dark Funeral, Nightrage, and Cipher System. It will be released on November 30th by Black Lion Records. To round out this Sunday’s collection of black assaults, I’ve chosen a stream of Darkness In Turmoil, the just-released third EP by the part-Swedish, part-Italian band Darvaza. It consists of three tracks and more than 22 minutes. It’s available now as a digital download, and will be released on CD and vinyl by Terratur Possessions. The Darvaza duo consists of Omega, who plays all instruments here and who, under other names including Thorns, has been the drummer for an extravagant number of other bands, and vocalist Wraath, whose resume includes positions in varying capacities with such groups as One Tail, One Head, Behexen, and Mare. Wraath sounds like a howling wolf at the outset of the first track, “A New Sun“, and Darvaza’s music does have a cruel, lycanthropic quality. The buzzing riffs are as grim as a rampant wolfpack on the heels of helpless prey, and looming death stalks through the slow, stalking chords of the music as well. Unsurprisingly, the drumming is exceptionally good. Wraath’s changing array of inflamed growls and crazed shrieks are full of rage and agony (and the clean vocals he reveals in the third track are solemn and morbid), while the music moves in adrenaline-triggering fashion between phases of poisonous, funereal gloom and lethal blood-lust. The songs also have an intrinsically occult and deeply sinister quality, whether they’re surging in displays of black thrashing mayhem, or moving in mid-paced lurching and rocking cadences, or plumbing pitch-black depths of mortifying catastrophe. All three of these tracks are damned strong, and all are quite memorable, but I’d recommend the remarkably dynamic “Towards the Darkest Mystery” if you only have time to check out one in deciding whether to go further. Completely agree. If I had more time this weekend, I would have included it either here or in a second part, but it demands more words than I had time to write. Hey Islander…you familiar with a band called Blood Storm ( https://www.metal-archives.com/bands/Blood_Storm/4106 )? One of those bands that seems to pop up sporadically and drop a new release when no one’s looking, and then disappear again for a number of years. If not, check them out, because they have a preview track up on Youtube for a new album. Might be worth a spotlight on the next Shades of Black post. Their name rings a bell, though the only mention we’ve made of them was in a write-up on the 2016 Shadow Woods festival, so I’ll definitely check out that new song. Thanks.